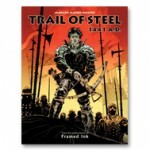 Author/Artist Marcos Mateu-Mestre applies all of the rules of visual communication that he outlined in his bestseller Framed Ink to create a graphic novel that will have you on the edge of your seat. Follow along with Condottiero Martin and his son Sancho during their dark journey through Spain in 1441 A.D. on a mission that will change their lives forever. Born on the Spanish island of Mallorca, Marcos Mateu was passionate about drawing and storytelling at an early age. This led him to work in the fields of illustration and animation for nearly thirty years. He is currently working at Dreamworks Animation as well as developing his own projects, such as graphic novels and books, including his recent bestseller, Framed Ink, drawing and composition for visual storytellers. Categories: artist series, Books. Tag: Marcos Mateu-Mestre. Building on the foundation established with Framed Perspective, Vol. 1: Technical Drawing for Visual Storytelling, artist and best-selling author Marcos Mateu-Mestre delves deeper into particular elements that can make or break an illustration with Framed Perspective, Vol. 2: Technical Drawing for Shadows, Volume, and Characters. Here he covers such challenging tasks as projecting shadows in proper perspective on various environments and depicting characters in perspective set in different situations—and makes them less daunting. You will also learn how to effectively observe a model or object in order to extract just the right amount of information to then translate it into an impactful graphic and visual image, the goal of every visual storyteller. Only in Framed Perspective, Vol. 2, will you find Mateu-Mestre’s imaginative scenes explored in great detail, revealing invaluable drawing techniques—from how to capture the essence of a character with one gestural line, to using clothing folds to further define the shape and volume of a character—to help you drastically improve your drawings. It all depends on your perspective! Perspective is a discipline often set aside when it comes to general art study, though it is essential to master in order to produce any piece of art that is and feels realistic. 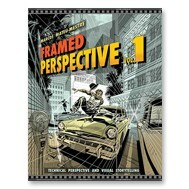 As intimidating as perspective may seem to aspiring artists, celebrated artist and author Marcos Mateu-Mestre takes the mystery out of understanding and applying it correctly with his highly anticipated two-volume collection, Framed Perspective. 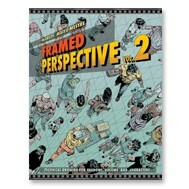 In FramedPerspective, Vol. 1: Technical Drawing for Visual Storytelling, Mateu-Mestre equips artists with the technical knowledge needed to produce successful visual storytelling–related drawings: from understanding the basics of the space around us and how we perceive it, to more sophisticated endeavors such as creating entire environments that are believable. Sure to be one of the most popular books in your art library, thanks to Mateu-Mestre’s thorough step-by-step explanations and awe-inspiring illustrations, Framed Perspective, Vol. 1 will train you to enjoy every curve and slope you see in the world and, more importantly, translate that vision into art with a solid comprehension of depth and proportion—in short, accuracy. Your perspective will never be the same!